As the proverb goes “face is the index of mind” thus “theme is the index of a site”. Though there are many factors affecting a site’s online success, undoubtedly site’s theme plays a vital role as a first point of attracting users. WordPress offers huge number of completely free themes which can be directly downloaded and installed through site’s admin screen. Besides free themes plenty of service providers also offer premium themes which can be bought from third party sites and uploaded in your WordPress server. But the fact is no single theme may satisfy all your need and you need lot of additional plugins to fulfill your need. If you decided to buy a commercial WordPress theme, there are some preliminary checks you should do before start building a site for long run. In this article explains 10 things to consider before buying a WordPress theme. Most of the commercial themes offer unlimited domain usage which means you can install the theme on multiple sites without paying additional money. If you have single site then this should not be an issue, when you run multiple sites or planned to create additional sites or subdomains then consider a theme offering unlimited domain usage. For example, a solid theme with unlimited domain usage is ideally suitable for WordPress multisite environment where you can install a theme on single domain and share it for multiple subdomains. Read the offer carefully when you buy a theme, some companies offer lifetime support and updates but most of theme providers offer support for only one year. If you run a very simple site and do not want recurring charges then a lifetime free update theme is a good choice but there is always a risk on this type of themes. Since WordPress itself upgrades its version, it is mandatory for themes to get adjusted to the latest WordPress version. If the theme is not updated for many years then your site will a target for hackers and will not support plugins made for latest WordPress version. On the other hand, yearly subscription needs a recurring charge that should be considered in your budget along with hosting and plugin charges. Getting a support is important when you struck up with something and need help to recover your site. Especially themes most of the times conflict with plugins and getting support here is tricky since the support consultant needs to login to your site and find which plugin may cause the issue (if you are not able to find on your own). Check the support period offered by the company, if it is one year then you need to pay for further support and updates. Go through forums and understand whether users are getting appropriate response. You may need to create an account in order view forum content. Go through theme’s documentation if available and ensure you will get what you think. Some themes also provide sample demo data for installation to install a dummy site with dummy content so that you can have a look of the site on your development server. Demo data will be really useful to check plugins compatibility which you want to use on your site. Read user reviews and ensure there is enough evidence for you to rely on the company and theme. Before searching for a theme, decide what type of theme you need for your site. Otherwise you may be lost with the huge number of WordPress themes available and end up in buying something different than your need. Create a checklist with the following items and filter themes matching your requirements. How many numbers of columns you need? 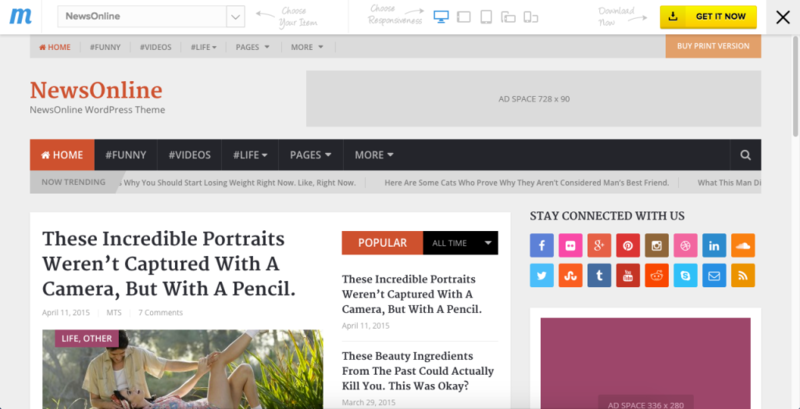 Though some themes offer customizable column layouts, it may not be looking good. Hence decide you want two column, three columns or newspaper type of layout with multiple columns. Do not rely on shortcodes to create columns, it will be really time consuming for a larger site and not feasible to use on each post of your WordPress site. Check the post width of the theme, whether it is neat or congested. Typography is another factor for choosing the style and size for different types of content. Ensure the theme has default options to choose the font and styles you want. Check the navigation menu and the style are suitable for you. Check the possibility of integrated menu items for login, registration, shopping cart, etc. Check the theme provides customizable header and footer area. Some themes do not offer footer columns which may not be suitable for you. The home page of the site is the one viewed by users most number of times. Hence check the features offered on home page like sliders, headers, logos, testimonials, parallax effect, contact us forums, etc. Check the sidebars are customizable if you are looking for creating custom sidebar. If you are planning to earn by displaying ads on your site then ensure to choose a theme with good ad support. These are only some examples; make your own checklist with the features you want like related posts, featured posts, trending, tag cloud, etc. then start looking for themes fitting your need. If selling product is your objective then you should choose a theme compatible with woocommerce or any other platform in WordPress. Check the theme has integrated shopping cart, PayPal or any other payment processor integration and has a nice layout to sell online products. Though it is difficult to predict the search engine performance of a site before really using for few months, there are few factors like page speed can be evaluated beforehand. For example, if you like an existing site then the best way is to use tools like WordPress theme detector and find the theme of that site. It will give you an overall idea of how it is performing in search results for the queries. Check features like breadcrumbs are supported so that search engines will show your categories in search results and you should be able to provide your own meta description for each post instead search engines pickup random description from content. With Google tightening its search algorithm for mobile searches, choose a theme supporting responsive design. Check the theme demo on various devices and ensure the visibility is good on both horizontal and vertical directions. Translation is a factor to be considered when you plan to build a site with primary language other than English. Ensure to choose a theme supporting built-in translation for displaying text on pages like 404 page, archive page, comment text, etc. Nowadays the situation becomes such a way that no site can exist without social media support. In order to spread the popularity of your site it is essential to have merged social integration on your theme. For example, post sharing, sidebar widget and comment login are the places where social integration is required with the minimal icons like Facebook, YouTube, Twitter, Google+, etc. though external plugins can handle this better look for a theme having blended social icons so that users are encouraged to share, follow and comment your content. Think how many themes you will use at the maximum on all your sites, unless you own a web company you will hardly use few themes on your sites. 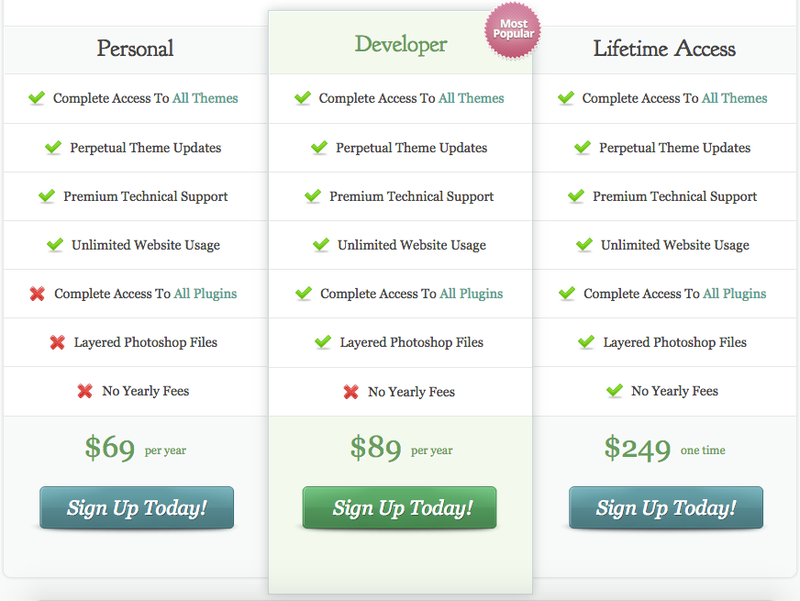 So do not look for the attractive offers like “pay $50 and get access to all 50 themes”. You will never be able to test and use all 50 themes in your whole lifetime. Even if it is $70 per theme it is better to check theme’s features and buy from a reputed company. Do not always look for a discount or coupons, saving few dollars and ending up with buying a poor theme will completely spoil the dream of your online presence. Again do not look for anything free with the theme like bonus theme or plugin. Over the period of time you may not use those free things and concentrate on what is the core theme you want to buy. Some very good themes offer custom page builder option which will only work with that theme or with that company themes. 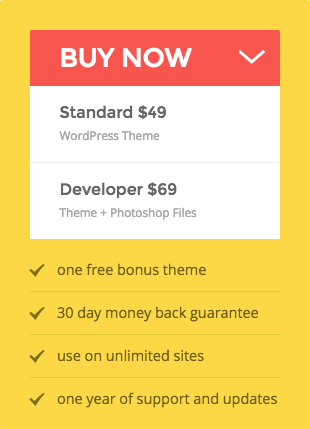 Do not buy such themes not supporting WordPress post editor. Custom page builder will become a problem later point of time when you want to switch your site to another theme.